a friend of mine picks them up every time she sees one & she sees them a lot. she was going through a hard time many years ago. she moved back to her hometown from los angeles. her family needed her. this was the 80's. you remember the 80's, right? the decade from hell, according to my friend, & not just because of the unfortunate fashions. jobs were scarce & she couldn't find one. so, she did what most of us seem to do when we're in trouble. she talked to God. I mean really talked to him while she'd be out taking a walk. that's when she started seeing pennies. lots of pennies. she'd bend down & pick them up off the sidewalk & slip them in her pocket. soon, she noticed it wasn't only on the sidewalk she'd see them. it seemed like they were everywhere. on top of the morning paper outside her door. a flicker in the grass would catch her eye. she could see it from a mile away. sparkling in the sun. like they were following her. she got some spotty temp jobs, a demeaning stint peddling yellow-page ads. she had to sell some of her things, but somehow, she always made rent. & she knew she had a lot to be grateful for. she pulled up to a traffic light. there on the pavement next to her car. hello there, she said. you're so pretty & shiny, & i know you've been working hard all of your life & you've got to be tired. why don't you let me give you a lift? as she picked it up and looked down at it in her palm, she remembered something. she'd sucked her thumb when she was little. it's how she comforted herself, always wrapped up in the same soft, satin-edged blanket. & like kids do, she gave her blanket a name. that's when she knew what they all meant. the pennies were God's way of comforting her now. letting her know everything wasn't going to just be okay, it already was okay. now, if you're thinking i'm making this up, or that I swiped it off the back of readers digest, or that my friend's a wackadoodle, which she's not, just work with me & listen to the rest of the story. okay? do you always pick them up, i asked her. 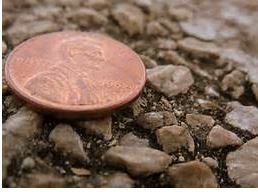 the 1st penny was over 30 years ago & even now, she finds one almost every single day. absolutely, she said. of course. what do you do with them? i imagined them spilling over her flowerbeds at home. lots of them are in piggy banks, & regular banks, too, she said, because she's traded lots of them in. but, she also has books & books of them under her bed. she'll tape them to the pages and write a little something alongside. like where she found them. & how she was feeling that day, before she found them & after. she's been seeing the same penny on her drive to work. right in the middle of a busy street & she sees it again on her way home, too. twinkling on the pavement, it seems to wink at her. it's been several weeks now, in the middle of all those cars whizzing by & the penny hasn't moved. all right, remember that line from grease? somebody's got to say it, so i guess it's got to be me. "see a penny, pick it up. all day long you'll have good luck." i think it sounds like a spectacular idea. don't you? TTFN & for anyone who doesn't know what that means, it's ta-ta for now.